SPIT BALL HARD TO CATCH. McGuire Doesn't Like It, and Elberfeld Says It Causes His Errors. Nearly every year develops fads among the big league pitchers in their efforts to originate new methods that will puzzle the batsmen, and each season has brought a rumor of a new curve that some pitcher has developed which will prove absolutely. unsolvable to the batter and which "bound to make baseball a new game." Thus, a few years ago there was a story afloat that some exponent of the pitcher's art had invented a "double shoot," a ball which so defied the. laws of gravitation that it would curve twice in its course, first in and then out, or combining a drop. and an up curve. The master of this wonderful ball, however, was never discovered nor its possibility ever proved. This year, however, Jack Chesbro hats introduced a novelty into pitching, which, while it is not as wonderful as the visionary double shoot, still is very effective in aiding its possessor to puzzle the opposing batters. This innovation ls known as "the spit ball." The first requisite for throwing this ball, the one which gives it its name; is to have the ball and. the pitcher's hand thoroughly wet. The ball is held, as in throwing any other curve, with the thumb and the first two fingers, but receives its peculiar motion from the way it slips out - because of the treatment it has been subjected to. The spit ball approaches the plate at medium speed, but just as it gets there, suddenly takes a shoot either to the right or left. The result is very puzzling to the batsman and, if he hits it at all, he is likely to knock a slow , grounder or an infield fly. The batter however, is not the only one who is puzzled by the quick curve. The pitchers have not yet gained thorough enough control of the ball, so that they can tell or in what direction it is going to shoot. In consequence the catcher has to take his chances of getting the ball on the glove or anywhere else, and unless he is unusually quick the chances are that he will stop it with some part of his body. The catchers who have to handle curve are, not at all in love with the innovation. 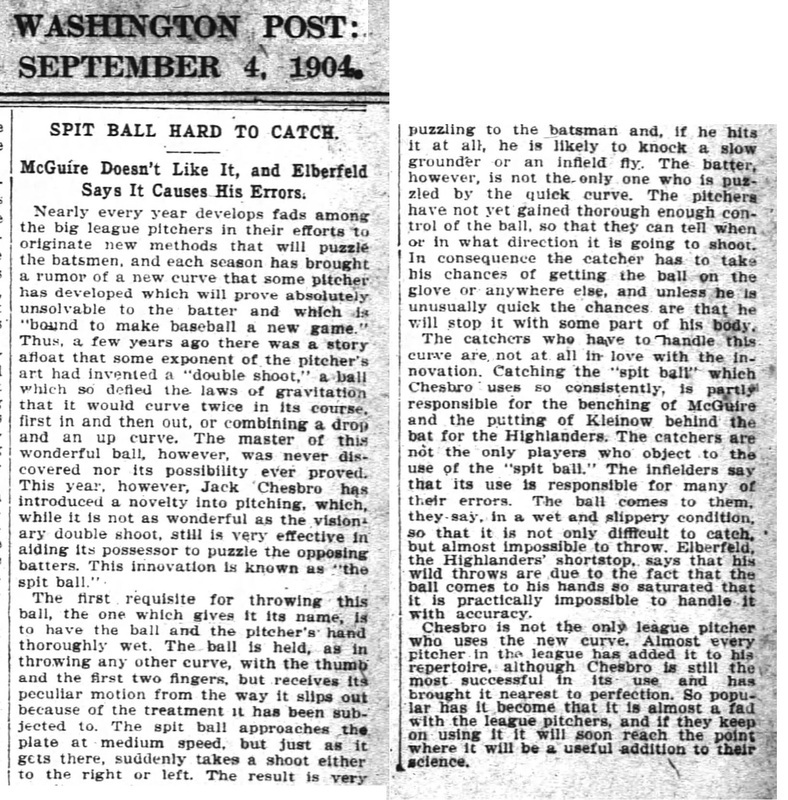 Catching the "spit ball" which Chesbro uses so consistently, is partly responsible for the benching of McGuire and the putting of Kleinow behind the bat for the Highlanders. The catchers are not the only players who object to the use of the "spit ball." The infielders say that its use is responsible for many of their errors. The ball comes to them, they say, in a wet and slippery condition, so that it is not only difficult to catch, but almost impossible to throw. Elberfeld the Highlanders' shortstop,. says that his wild throws are due to the fact that the ball comes to his hands so saturated that it is practically impossible to handle it with accuracy. Chesbro is not the only league pitcher who uses the new curve. Almost every pitcher in the league has added it to his repertoire, although Chesbro is still the most successful in Its use and has brought it nearest to perfection. So popular has it, become that it is almost a fad with the league pitchers, and if they keep on using it it will soon reach the point where it will be a useful addition to their science.